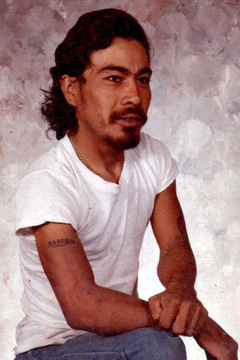 Rosary for Roman Cantu, 61 of Lubbock will be Sunday, October 7, 2018 at 7 PM at Calvillo Funeral Home Chapel. A Funeral mass will be celebrated on Monday, October 8, 2018 at Our Lady of Guadalupe Catholic Church with Father Martin Pina officiating. Cremation arrangements were made under the direction of Calvillo Funeral Home and Chapel. Roman went to be with the Lord on Friday, October 5, 2018. He was born on February 27, 1957 in Lubbock to the late Leonso and Celia Cantu. Roman was a 1976 graduate of Estacado High School. He loved to be around his family, especially his nieces and nephews. He is preceded in death by his parents, a twin brother Ramon Cantu, Natividad Cantu, Larry Cantu, Santos Cantu, Jose Luis Cantu, two sisters Gloria Cantu and Elvira Cantu. He is survived by his brothers Juan Cantu, Rudy Cantu, Mike Cantu, Alonzo Cantu all of Lubbock, and Arnulfo Cantu of Austin, his sisters Consuelo Cantu, Teresa Rebele, Hortensia Deaver of Lubbock and Adela Garcia of Wolfforth.